Last week in Adelaide and Sydney we launched our Australian Web Observatory which is now a “node” within the global network of Web Observatories. My presentation can be found here, and Ramine Tinati’s overview of SOCIAM and the Web Observatory can be found here. The Australian Web Observatory is hosted at the University of South Australia and a huge thanks to Andy Koronios, Markus Stumptner and Wolfgang Mayer, who worked with Professor Dame Wendy Hall, Thanassis Tiropanis, Ramine Tinati, Xin Wang and Kieron O’Hara, to champion this project, install the system and upload the first data sets. The Observatory can be found here. 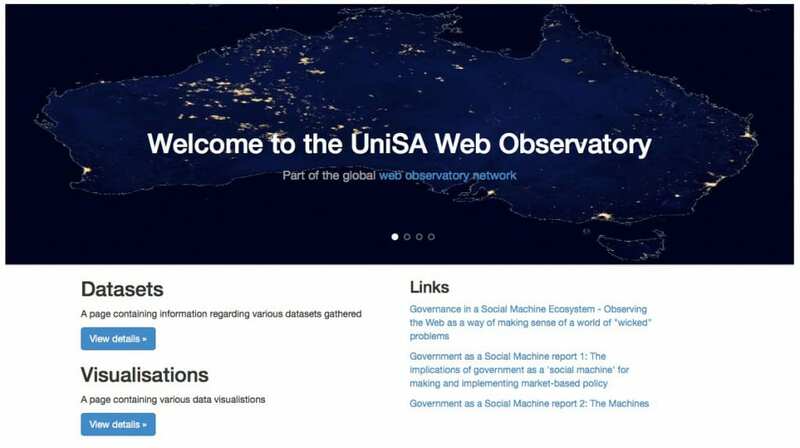 I have written previously about the Web Observatory, or more correctly, Web of Observatories, which is a powerful approach to observing and studying the Web and “a global data resource for the advancement of economic and social prosperity“. The Australian Observatory is a world-first. All of the other Web Observatories within the Web Science network are primarily research-focused and serve communities within their host Universities, mainly Web and Computer Science. The Australian Web Observatory is different because it has emerged from a research project driven by a desire to link data and information directly with policy development in order to help public sector managers in their daily work. Our aim is to develop a platform within which non-technologists can work directly with data to more fully understand its relationship with policy, but also to more effectively challenge that data in terms of the “evidence” it presents. We have also sought to bring public sector policy people into direct contact with leading-edge socio-technology research, and, from the outset, ANZSOG has sought to bridge this gap between research and practice. I would especially like to also thank Peter Debus and Sophie Yates for their ongoing support and faith in the work we have been doing, and Tim Mares, Aron Hausler and Sonny Lee from the Government of South Australia for their investment in, and ongoing patronage of the project. However, launching the Australian Web Observatory is just the beginning. The platform itself isn’t what is really new or different in technology terms, although what now exists is of enormous value and it is only thanks to the valiant efforts of all involved that ANZSOG now has a world-class research platform. What is new is the network and the community which Australia can now join by having its own Web Observatory, and the ability to share data, analytics, visualisations and knowledge both locally and globally. When Tim Berners-Lee’s first demonstrated his “World Wide Web” as a simple solution to the “information management” problem many were unimpressed, but they missed two things: firstly Tim decided to give it away for free, and secondly he relied on the “network effect”, the fact that people using the system would make it more valuable. And history has proven him right. This is precisely the same logic that is driving the Web of Observatories, and it will only be through people from all walks of life, and for all different purposes, using the Web Observatory that it’s true value will be appreciated. With this in mind one of the other key features of the Web Science Web Observatories is in its particular approach to data provenance. For those who work with data much of the risk, and therefore hesitancy, to utilise platforms is the lack of control that they feel that have of it once it is published. The Web Observatory seeks to address this by enabling data sets to be “open” or “closed”, “public” or “private” and the data owner has the ability to provide access in whatever way they wish with those who request access. This is demonstrated in the following graphic or by exploring the data sets available on the Southampton Web Observatory here. For us building the Australian Web Observatory is a key tool with which to explore the idea of “Government as a Social Machine” (I have previously described the Social Machine), and our aim is to complement and support the work being done by SOCIAM, a major UK research project, which aims to “understand how Social Machines evolve in the wild and what factors influence their success and evolution … (in order to) … develop both theory and practice so that we can create the next generation of Social Machines”. How do we build a “Social Machine” to better observe the workings of government? 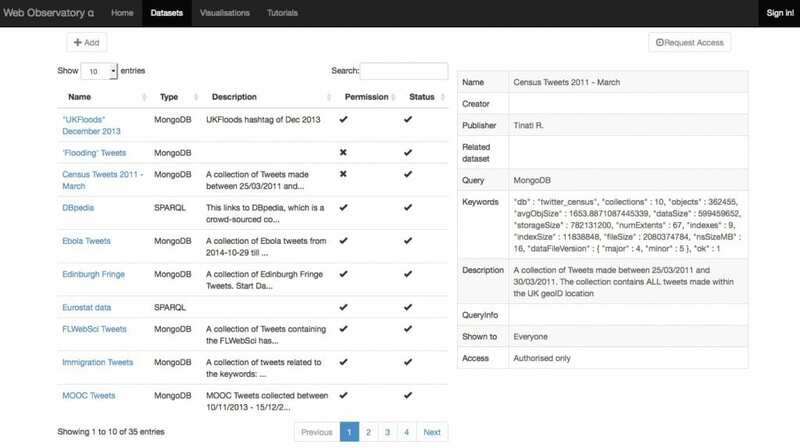 How can this Government Web Observatory better inform the creation of public policy? What are some of the key challenges, which governments will face as a result of being armed with a Web Observatory? At the recent Adelaide and Sydney workshops we explored these questions utilising the Harvard Kennedy School’s “Strategic Triangle” on “creating public value” which Peter Thompson and I have used over the years in our teaching. Ethos – what is the important “public value” that is being produced? ?Pathos – what “sources of legitimacy and support” would be relied upon to authorize particular actors (and organisations) to take action and provide the resources necessary to sustain the effort to create that value? ?Logos – what “operational capabilities” would be required to deliver the desired results? In Adelaide we decided to focus on one specific public policy area in order to demonstrate the link between data and policy to a non-technical audience. During the planning of the workshop Ania Karzek from Southern Cross Care Australia, suggested that we utilise the recommendations of the 2013 Kalache Report, “The Longevity Challenge”, as a starting point, and from this we analysed the relationship between two of the recommendations and the data which may, or may not, inform them (see Ramine’s slides). What this demonstrated was both the potential and limitations of data driven policy and the power of utilising something like the Web Observatory in two ways. secondly, it made deductive reasoning explicit in terms of challenging the validity of the recommendations themselves and policy ideas from what the data can tell you. As we discussed this Tim Mares pointed out that our second research question (about the link between the Web Observatory and the creation of public policy) is iterative – one feeds the other, and thus by enabling data to be more transparent and accessible the “Social Machine” of Government begins to inform itself. This is something that deserves further exploration, especially when it comes to the need for a greater digital literacy in working with data, and being able to interrogate and interpret it more fully. In Sydney we focused more broadly on how to utilise the Web Observatory as an effective and persuasive teaching tool. In his speech opening CeBIT in Sydney last week NSW Finance Minister Dominic Perrottet highlighted the impact that “millennials” (those born between around 1980 to 2000) will have on government. “Research shows that they are unattached to organised religion, unaffiliated with political parties, overburdened by debt and distrustful of institutions. They are sceptical of big government, and more likely to be social entrepreneurs than public servants. If nothing else this is a crucial reason for governments to embrace digital services, but in order to do this there is the need to have better digital leadership. The Chief Information Officer of the Reserve Bank of Australia, Sarv Girn, reinforced this at the Economic Development of Australia (CEDA) forum last week. The first is the “hardwiring” that ropes in “policies, regulation and rules that govern a society or organisation and enables it to succeed. In a society or community sense, this is about leadership in laws and rules that encourage start-ups to flourish without inhibitors, and allowing their home presence to be retained as they become successful”. I have been stressing the need for modern societies to focus on developing digital literacy for years, but I believe that the Web Observatory can help people become more digitally literate by the sharing of not just data, analytics and visualisations, but by sharing the learning experiences they have through using it. With this in mind I would like to thank Leanne Fry and her team at the Office of the Fair Work Ombudsman who gave their time and insights as to how this might work, and this is now the area upon which I am going to focus. Over the next couple of months we will be publishing our final report together with some papers to be presented by the team at the 2015 Web Science conference, and if you are interested in finding out more please get in touch, or just keep any eye on this blog.